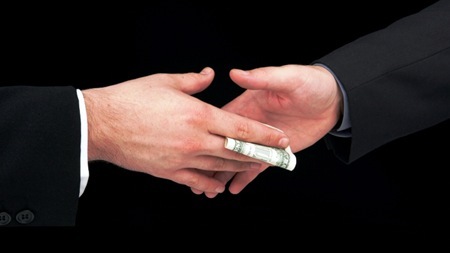 Do you know that Indian Government has a website giving you details of people who have been caught taking bribe? I happened to look at the latest July 09 report to check out how many of them have been caught taking bribe and the action that was taken against them. With India being one of the most corrupt countries in the world, I was pretty sure that monthly number would be quite sizeable. But upon seeing the report, I was left in utter dismay. Out of literally lakhs of Government officials only 522 cases were referred to Central Vigilance commission – 258 cases will see some action against them. Of these 258 corruption cases Government will launch prosecution cases again 22 of them and 236 may be imposed major penalty. Here is the interesting part – Due you know what a major penalty means? A small cut in pay (from 5% to 25%), a small cut in pension or gratuity (5% to 30%) or probably temporary suspension from duty (3 to 6 months). Out of all these cases only 3-4 of them will face dismissal from service. Here is the July 09 CVC report – Have a look and decide for yourself. Also, the surprising part is that all of them who are caught are just the smaller pawns – who is looking at Politicians and senior officers in the Government – They are the biggest culprits, not a single case will be ever registered against them. Is our government doing this enough to curb corruption? isn’t it a no brainer that far more stricter penalties should be handed to these corrupt officers. to curb corruption in india, do not vote politicians. Really it is a good initiative. Keep up the good work. Let us make India, a corruption free country.